Music is very important to our worship. Hymns are selected from the 1982 Hymnal. Canticles are selected from both the 1940 and 1982 Hymnal. Other music selected for use in our services is in keeping with the traditional Anglican tradition. 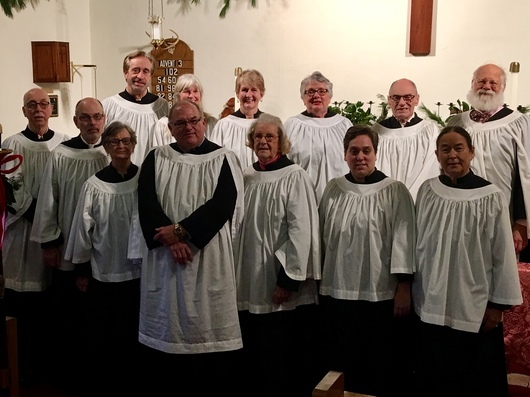 A growing and faithful adult choir sings portions of the liturgy as well as leading the congregation in the Psalms, Hymns, and Canticles. We are always looking for new choir members. The ability to read music, while desirable, is not necessary. If you feel you have the slightest gift of music and singing, why not share that talent? The choir rehearses at 10 a.m. in the fireplace room adjacent to the sanctuary. We would love for you to join us.